Defying international pressure, the British band Radiohead played its longest set in 11 years in Tel Aviv on July 19. The BDS movement has been stymied in the political arena by legislative initiatives. But through deliberate obfuscation new efforts to expand anti-boycott legislation have now run afoul of free speech concerns. BDS in the cultural and social spheres has less intersectional cover for its antisemitism, as shown by protests against LGBTQ Jews and bands performing in Israel. In contrast, churches use social justice, human rights and Christian theology as cover for anti-Israel and antisemitic actions. The ability of the BDS movement to utilize different concepts as cover for its antisemitism in varying contexts has been obvious. But with intense scrutiny, the mask occasionally slips, revealing its true nature and permitting pushback. During the summer the focus of the BDS movement has shifted from academia and politics to culture and other areas. The most substantive development is a proposed amendment to long-standing US anti-boycott laws. 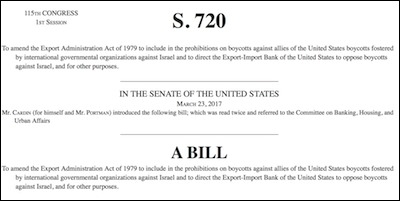 The "Israel Anti-Boycott Act" would modify the 1979 Export Administration Act to forbid US companies from engaging in boycotts requested by foreign countries or the United Nations. The Israel Anti-Boycott Act of 2017 would forbid US companies from engaging in boycotts requested by foreign countries or the United Nations. The bipartisan legislation has produced a firestorm of objections, most notably from the America Civil Liberties Union (ACLU), which declared that the legislation would unconstitutionally restrict free speech. The language of the bill is in fact designed to thwart stealthy commercial boycotts where companies are warned privately by foreign entities to stop doing business in Israel but which do not announce their decisions publicly. But the free speech argument has been sufficient to cause several members of Congress to express doubts on the bill while putting others on the defensive. Legal analysts have shown that the ACLU incorrectly interprets the amendment as prohibiting free speech that calls for Israel boycotts. But the amendment only prohibits actual commercial boycotts, that is to say, action taken at the behest or demand of foreign entities. There is a vital distinction between expression, which can't be regulated, and commercial conduct, which can. The distinction between expression, which cannot be regulated, and commercial conduct, which can be, is vital. If carried to the logical conclusion, the ACLU's argument conflating the two would invalidate all foreign economic sanctions. Media accounts and legal analyses of the amendment have ranged from benign to hysterical. More ominously, accounts of local anti-BDS laws have also been challenged in media accounts, which typically describe them as sops to Jewish voters. Also notable is the stated opposition from MoveOn.org, the far left political action group, which has depicted the amendment as an infringement on free speech. Overall, the controversy shows two conflicting processes at work. The first is the construction of legal impediments to BDS at the national and state levels. But the second is a strategy (or at least a process) by which restrictions on BDS are becoming associated with limitations on free speech. Paradoxically, the BDS movement, which seeks limits on both pro-Israel speech and action, is being championed as the epitome of free speech. The ACLU opposition to the anti-BDS bill came at the same time the organization expressed its support for BDS leader and Islamist Linda Sarsour and echoing its earlier championing of her 'intersectionality.' This suggests if nothing else the convergence of progressive entities, including around opposition to Israel. 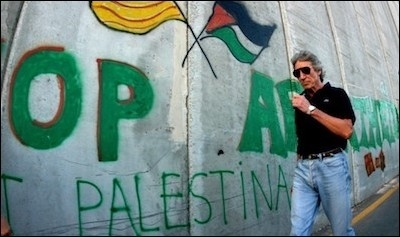 Former Pink Floyd frontman Roger Waters has vigorously pressured other musicians not to play in Israel. 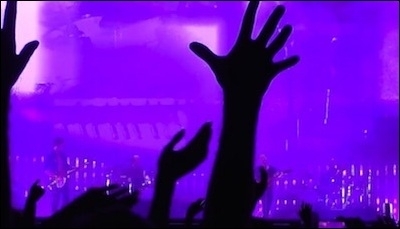 In the cultural sphere July was a particularly important month since it saw the British band Radiohead play in Israel against enormous pressure from the BDS movement and from its few notable cultural figures, specifically Roger Waters, formerly of Pink Floyd. Waters had repeatedly criticized Radiohead in advance of their performance and in the process compared Israel to Nazi Germany. He was joined by a number of other BDS supporting cultural figures including film director Ken Loach (whose films were being shown in Israel). BDS supporters (who were also shown to Holocaust deniers) had heckled Radiohead performances in Scotland. The acrimony of the exchange between Waters and Radiohead front man Thom Yorke was significant, with Yorke accusing Waters and the BDS movement of being patronizing and divisive. International celebration of Israeli actress Gal Gadot in her role as Wonder Woman shows that the cultural boycott against Israel is at a low point. 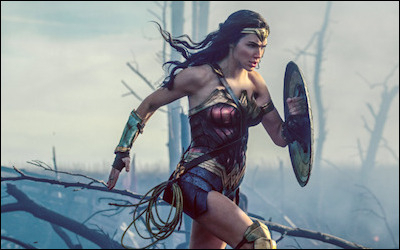 The example of Radiohead, and the celebration of Gal Gadot in her role as Wonder Woman, shows that the cultural boycott against Israel is at a low point. But the cultural boycott has always been as a means of propagandizing, particularly to young people, a process that continues in other spheres, particularly at universities. The BDS movement, like antisemitism as a whole, uses different rhetoric in different settings. Human rights, social justice as well as traditional Christian antisemitism, have been extensively exploited, since they act as formal or quasi-liturgical underpinnings for the secular religion of transnational progressivism. This was on display in July as the Mennonite Church USA voted to divest from investments in Israeli communities across the Green Line as a protest against "Israeli policies in the occupied territories." A church leader was quoted saying "As a national church, we do not fully endorse all components of the broad BDS movement or approve all of the tactics it employs. However, we believe divestments are in order." Reports indicated that the Mennonite were inspired by the 'Kairos Palestine' document, a Palestinian Christian document that preaches supersessionism. The Mennonite decision came as the Christian Church (Disciples of Christ) and United Church of Christ condemned Israel for allegedly detaining Palestinian children. The statements made no mention of Palestinian incitement or violence. 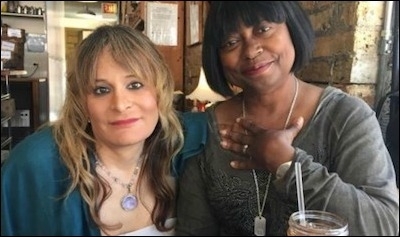 Journalist Gretchen Rachel Hammond (left), who gained fame last year for donating a kidney to a reader, Elvie Jordan (right), was demoted for exposing the expulsion of three Jewish women from the Dyke March in Chicago last month. Another example of the intersectional cult of BDS taking root in progressivism was the continued fallout from the Chicago Dyke March scandal, where Jewish participants were excluded over their use of the Star of David. The reporter for an LGBTQ newspaper who exposed the controversy was demoted and subjected to harassment, while march organizers took to social media to mock Jewish responses, using classic white supremacist slurs. The controversy expanded with reports that the upcoming Chicago SlutWalk would ban "Zionist displays." The SlutWalk organizers credited 'Jewish Voice for Peace,' an organization that now has an extensive record of harassing Jewish LGBTQ individuals on the basis of support for Israel. Other members of the SultWalk 'collective', however, denied the reports and claimed that only 'bigoted' or 'threatening' behavior would be banned. The BDS movement's successes demonizing 'Zionism' and Israel in LGBTQ circles are deeply ironic given Palestinian (as well as broader Arab and Muslim) treatment of gays and others. The strategy of forcing individuals to chose between connections to the LGBTQ community and Israel is also reminiscent of longstanding socialist and communist practices, with the difference that it preys on the vulnerability of victimized or marginalized Jews. On July 16 newly elected French President Emmanuel Macron called anti-Zionism a "reinvented form of anti-Semitism." In the international arena, recently elected Emmanuel Macron made a forceful statement in which he denounced anti-Zionism as a "reinvented form of anti-Semitism." 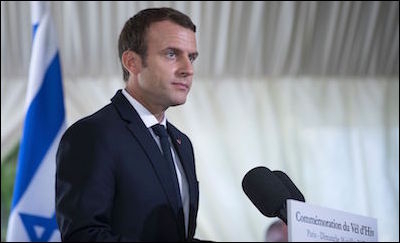 Macron's statement came during a commemoration of the roundup of French Jews in July 1942, in which he highlighted French responsibility for the deportations and murders. In contrast, Irish president Michael Higgins met BDS movement leader Omar Barghouti at a trade union conference. Higgins praised the conference organizers for their "internationalism by organizing fringe events and by inviting Omar Barghouti who will speak on the challenge ahead for Palestine." Israeli representatives protested the meeting. On a more positive note Spanish courts invalidated more municipal BDS laws. The Spanish high court also invalidated corporate boycotts of Israel, calling them 'discriminatory.' Elsewhere, after being challenged, the Ontario government quickly reversed a decision that mandated labels for wines from Israeli communities across the Green Line. The products will now be labeled 'Made in Israel.' The incident again highlighted how Israeli products are subjected to labeling requirements while those from other countries with disputed territories are not. Finally, in the academic sphere, the celebrations on social media by Students for Justice in Palestine (SJP) chapters of the murder of a Jewish family after the latest Temple Mount disturbances represent an ominous trend. This, and growing SJP support for the Islamist trope of the 'defense of Al-Aqsa' portends the transcending of the current 'anti-normalization' basis for BDS and the full unmasking of religious opposition to Israel, as well as the potential for expanding violence on US campuses. Theological support for the violence against Jews was recently documented from an imam of a mosque across the street from the University of California at Davis. The discovery of the video may provide additional context for the intensity of BDS and anti-Israel activity at UC Davis. Alexander Joffe, a Shillman-Ginsburg fellow at the Middle East Forum, is a historian and archaeologist. He is the editor of SPME BDS Monitor, published by Scholars for Peace in the Middle East (SPME).